Used for depth control when drilling with twist and brad point drill bits. Made of cold rolled steel with black oxide finish. Includes (1) one each: 3/16", 1/4", 5/16", 3/8", 7/16", 1/2", hex wrench and reusable snap blister. Made from nickel-plated steel and used for accurate match and transfer of dowel holes. Includes: (2) two each: 1/4", 5/16", 3/8? and 1/2". Use for joints where strength is critical; biscuits swell in joints for maximum strength. Use for joints where strength is critical; biscuits swell in joints for maximum strength. Precision sharpened for smooth cuts, and longer life blade coating prevents rust and reduces friction Thicker body provides increased durability in heavy duty applications. Fully hardened steel body prevents blade warping and binding. Thin kerf, .086", portable construction saw blade. Precision sharpened teeth for fast, smooth cuts. Blade coating prevents rust and reduces friction. Fully hardened steel body prevents blade warping and binding, .050" plate, 7,000 rpm. Universal quick change adapter; when inserted into the chuck of a power drill it allows for the quick change of all bits that have a 1/4" quick change shank. Allows accurate installation in wood doors by adjusting easy guide template arms to desired door thickness and backset sizes. For door sizes: 1-3/8" and 1-3/4". back set sizes: 2-3/8" and 2-3/4". For cutting ferrous metals such as sheet metal, corrugated steel roofing, siding and partition studding to 1/8" thickness. Blade must be lubricated for best results, teeth should be cleaned of burrs to prevent gumming. Not designed for fully hardened steel such as steel beams and related metals. Use cut-ease stick wax for best results. Tested design normally found only in industrial grade chucks. Thin kerf blade for circular, cordless and portable cordless saws. Designed for faster, cleaner cutting. Designed for smooth fast cuts. Durable, machine welded carbide tips. Anti-kick back safety feature. C45, 12 degree hook angle, 7,900 RPM. Carbon hole saws for wood doors, fits all interior and exterior doors, self centering jig fits all common door widths, adjustable for both 2-3/8" and 2-3/4" backsets. Includes: double sided jig, (2) carbon hole saws, 3/8" mandrel, bolt plate template, custom router bit, and hinge plate template. For use on wood doors. Includes: positioning template for marking hole location, drill guide for accurate pilot holes 2-1/8", hole saw blade for fast cuts in hard woods, 1" spade bit for drilling edge bores, mandrel 3/32", Allen wrench, 1" wood chisel, 5/32" pilot drill centering template. Tested design normally found only in industrial grade chucks. Allows accurate installation in wood or metal doors by adjusting easy guide template arms to desired door thickness and backset sizes. For door sizes: 1-3/8" and 1-3/4", back set sizes: 2-3/8" and 2-3/4". Bi-metal hole saws for metal and wood doors, fits all interior and exterior doors, self centering jig fits all common door widths, adjustable for both 2-3/8" and 2-3/4" backsets. Includes: double sided jig, (2) bi-metal hole saws, 3/8" mandrel, bolt plate template, custom router bit, hinge plate template. Features a non-rusting, high-performance body with a unique sure-grip sleeve for maximum user comfort and hand tightening efficiency, reduces bit changeover time and boost productivity, never a key to misplace. Allows for round shank drill bits to be used in 1/4" hex quick-connect shank. Metal Impact Driver Keyless Chuck is a drill attachment that is made from metal. This chuck can convert an impact driver into a driver drill. It accepts round and hex shank bits. Thin kerf, .094", saw blade for miter saws and table saws. Laser cut stabilizer vents. Durable MicroGrain Titanium Carbide for razor sharp cuts and long life. PermaShield permanent coating prevents gumming and corrosion. Alternate tooth bevel, .063" plate, 9,000 max rpm. Allows accurate installation in wood or metal doors with the two most common sizes for accurate installation. Attached pass through shank arbor, variable pitch positive rake teeth reduce vibration and clear chips, M3 cutting edge is longer lasting and teeth are shock resistant. Includes (1) each: 1", 2-1/8" high speed steel hole saws and 4-5/16" pilot drill. Compact injection molded hole saw kit box with carrying handle. Three trade specific configurations contain the most commonly used sizes. Utilizes C-clamp design with tool free clamping and no surface damage, compatibility for the two most common backsets and door thicknesses. 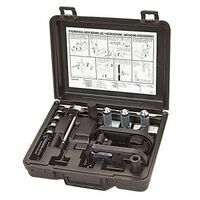 Includes: 1", 2-1/8", mandrel, adapter, drill guide, replacement parts (including two additional pilot point centering bits), two adjustable bushings which accept both standard backsets and both common door thicknesses, and new quick change mandrels (DW1803 and DW1810) for increased user productivity. Single sleeve design allows for single handed tightening. Built with all-metal construction for maximum durability; 1/4" hex quick connect allows users to change from fastening to drilling. Thin kerf, .071", saw blade for circular saws. Innovative heat vents and expansion slots for straighter cuts. Reinforced shoulder for durability. Designed for framing and ripping. Alternate top bevel, 20 degree hook angle. Smoother cut from exclusive plate technology. Reduced cutting force: teeth are face ground/sharpened. Impact resistant. 18-degree hook angle. ATB tooth grind. 7000 RPM. Thin Kerf, .076", circular saw blade. Designed to deliver the cut quality, speed and durability to stand up to the toughest jobsite use. Wedge shoulder for increased durability and ribbed heat vents eliminate blade flexing and binding for long lasting performance. ATB tooth design, plate, .050", +15 degree hook angle. Unique revolving turret design is extremely accurate and simple to use for end to end, edge to edge or edge to end doweling. Accepts 6 sizes of twist bits: 3/16", 1/4", 5/16", 3/8", 7/16" and 1/2". Guide bars are graduated for fast positioning of hole center. Used to making fast, accurate dowel holes in furniture and other carpentry applications. Includes: three (3) brad point drill bits: 1/4", 5/16" and 3/8", 30 dowel pins: ten (10) of each 1/4", 5/16" and 3/8", (3) three drill stops: 1/4", 5/16" and 3/8", (8) eight dowel centers (2) two each: 1/4", 5/16", 3/8" and 1/2", 1 hex wrench, craft glue. Cuts through ferrous metals quickly and accurately leaving clean, burr free cuts; features teeth with Triple Chip Grind (TCG) and a special carbide blend with outstanding resistance to the high impact generated by steel cutting. Thin kerf, 103", saw blade designed to cut through ferrous metals quickly and accurately leaving clean, burr free cuts. Used for cutting steel studs, steel pipe and steel sheet. For most mild steels under 1/8" thick. Used for crosscutting oak, pine, malamine, plywood and moulding. TCG tooth design, .090" plate, -2 degree hook angle, 1,800 max rpm. Thin kerf, .087", saw blade for sliding miter saws and radial arm saws. Laser cut stabilizer vents for reduced vibration and precise cuts. Durable MicroGrain Titanium Carbide for razor sharp cuts and long life. PermaShield permanent coating prevents gumming and corrosion. Used for crosscutting oak, pine, malamine, plywood and moulding. Alternate top bevel, .063" plate, 7 degree hook angle. Resharpenable titanium carbide-tipped teeth with impact-resistant trifoil brazing material. Modified triple chip grind for added durability. 5,800 max RPM. Replacement blade for DeWalt DW682K (611.2122 ) plate joiner. Laser cut blade with metal cutting grade carbide teeth, anti-kickback tooth shoulder and laser cut anti-vibration vents. Cuts through ferrous metals quickly and accurately leaving clean, burr free cuts; features teeth with Triple Chip Grind (TCG) and a special carbide blend with outstanding resistance to the high impact generated by steel cutting. Re-designed versatile hex shank drive shaft attached directly into the chuck of virtually any drill or 1/4" quick release chuck impact driver. Offset design saves hands. Navigates tight patterns and square cuts. Cuts a variety of building materials. 20 gauge capacity in galvanized steel. Use TS1RB TurboShear replacement blades. Bi-metal construction and hard steel RC 65-66 for long life; 4/6 variable pitch teeth for reduced noise and improved performance with clearly printed hole saw sizes for quick retrieval. Includes (1) each: 7/8", 1-1/8", 1-3/8", 1-3/4", 2" and 2-1/2", (1) each: 1/2" hex shank, 3/8" hex shank, pilot drill and carrying case. Thin kerf polished saw blade for circular saws. Used for cutting mild steel up to 1/4" - 3/8" thick. Triple chip grind; 5,800 RPM. Thin kerf polished saw blade for circular saws. Used for cutting mild steel up to 1/4" - 3/8" thick. Triple chip grind; 5,800 RPM. Thin kerf polished saw blade for circular saws. Used for cutting mild steel up to 1/8" thick. Alternate top bevel; 5,800 RPM. Cuts up to 18 gauge material including, but not limited to sheet metal, corrugated sheet metal, duct, asphalt shingles, steel mesh, vinyl siding, wire, plastics, cardboard and rubber. 360 degree swivel head allows for maneuverability when cutting. Works with most 18 to 20 VAC impact driver and drill tool brands. 1/4" hex shank. Yellow/black color. The telescoping drill clamp fits drill and impact drivers large and small, including newer Lithium-Ion models. It also allows the tool to rotate 360? and lock into position. The adjustment wrench stores with the tool, preventing loss. The hex shank drive shaft attaches directly into the chuck of any drill or impact driver. The TSHD navigates tight patterns and square cuts while cutting a variety of building materials. 18 gauge capacity in galvanized steel. Long-life, dual ball bearings. Use Replacement Blades TSHDRB. Utilizes a deep cut technique, which broadens functionality by increasing the variety of widths the saw is compatible with; tooth and set guide, broad, toughened backing plates that avoid marring around the bores. Bi-metal section made from M3 steel for added protection against jobsite abuse. Includes (1) each: 7/8", 1-1/8", 1-3/8", 1-3/4", 2, 2-1/2", small Quick Change mandrel, large Quick Change mandrel, replacement parts and a rugged kit box. High speed steel teeth are reinforced to cut stronger, last longer, resists tooth strippage and withstands high torque. Includes (1) one each: 7/8", 1-1/8", 1-3/8", 1-3/4", 2", 2-1/2", arbors: 2L, 5L and carrying case. This versatile and portable TurboShear fits a drill you already own to make easy cross cuts, fast lengthwise cuts and precise circular and square outlet cuts in large or small pattern corrugated metal roofing and common trapezoidal (box) pattern metal roofing panels. Elongated blades with compact jaws create a steep 75 degree offset so that the drill is held at a nearly vertical approach when starting a cut. As these offset blades follow the rising angle of a corrugated or trapezoidal profile, the drill handle or battery pack has clearance to naturally tip downward and still clear the roofing panel surface. A sleek, lightweight aluminum-cast shear head and compact molded polymer drill clam allow maximum portability and ease to go wherever the work is. The telescoping drill clamp adjusts to fit both length and width of popular drill sizes including smaller bodied Impact drivers. Optional spaces are stored on clamp for large motor housings. The clamp collar allows the shear head to be rotated 360? and set in any position for optimum tool clearance when navigating profiles or to facilitate easy material flow. The shear can operate at high or low speeds for the control you need to follow a precise life in 30 to 24 gauge (0.31-0.61mm) roofing panel metal. A lateral blade adjustment capability ensures that optimum cutting performance and maneuverability can be maintained for the life of the blades. Make your drill a double-cut metal shear. Now you can get double-cut performance in a versatile Malco TurboShear. Fits the corded or cordless drill you already own. A compact telescoping clamp accommodates both length and width of any size motor housing, including smaller impact drivers, to ensure easy one-hand operation. Optional spacers are stored on clamp for large motor housings. The clamp collar allows the shear head to be rotated 360? and set in any position for optimum tool clearance. The blades of Malco Double-Cut TurboShears remove a narrow spiral scrap from the tool path to produce a clean, straight edge on both sides of the cut. These blades can approach a cut from either end to produce a quality work-piece edge. They can also navigate up to 90? outside profiles of metal roofing panels, or metal ductwork, and are beefy enough to cut through seams. You can easily disengage the blades from the cutting path or quickly re-engage to continue cutting. The long lasting carbon steel blades are also easily replaced on the job.